Does my child suffer from BO? 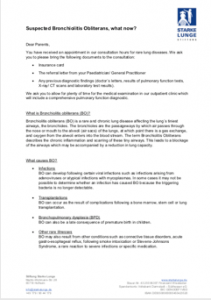 Your child suffered from a severe respiratory tract infection and is already coughing for several weeks. Physical activities may be dampened and the sleep is profoundly disturbed. The previous therapeutic attempts were not successful or only led to a short-term improvement. Such or similar symptoms may be signs of a BO. Here, the specialist can help by excluding other eligible medical conditions with lung function testing, an X-ray examination, allergy- and other tests. 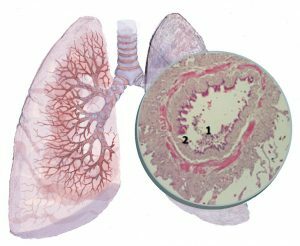 Typical findings would be the evidence of a significant narrowing in the small airways (bronchioles), and hints of hyperinflation in lung function testing. The chest X-ray may suggest bronchiectasis and unevenly distribution of air. In these cases it might be helpful to perform a HR-CT. In sputum one may find numerous immune cells (especially neutrohilic granulocytes). Suspicion Raised – what next? If confirmed, it is strongly recommended to consult a specialist to treat the disease according to the present state of knowledge. With him/ her you can discuss how the progression of the disease may be altered and how the prognosis can be improved.